I wasn’t expecting much more than a beach when I stepped off the train in Brighton, so I was happily surprised to find a beautiful, art-filled city full of amazing coffee and vintage shops awaiting my exploration. 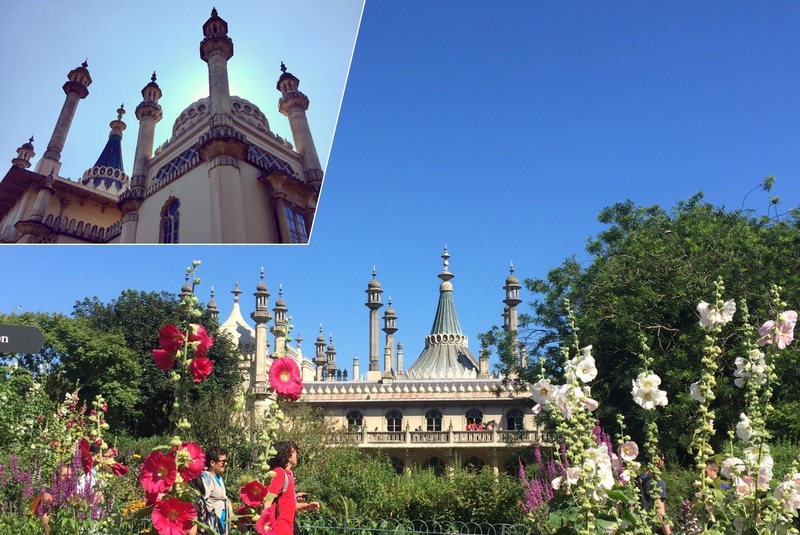 Brighton certainly lives up to its name–it’s full of colour! From colourful houses with colourful doors, to fun-loving street art and narrow, bannered street markets, the whole city feels like the set of a Wes Anderson film. Straight from the train to the beach — or that was the plan anyways. Its easy to get distracted in Brighton. 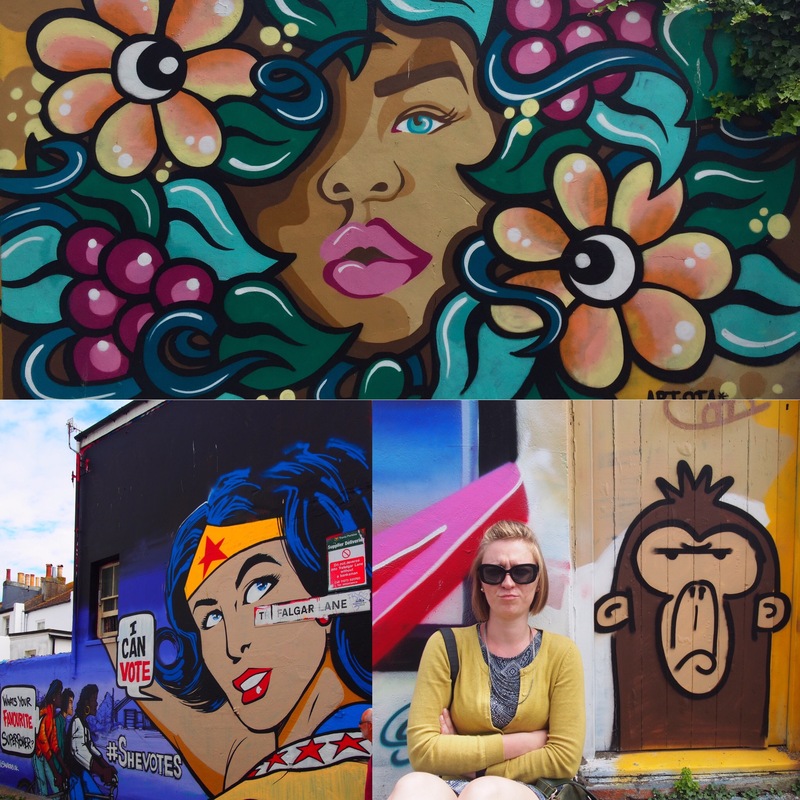 Our first stop ended up being street art, vintage shops, and many, many colourful homes! If you have a bit of a thing for pretty, interesting, or colourful doors Brighton is the place for you; home owners take pride in their front stoops and entryways in a very artful way. When we did make it to the beach we were rewarded by a very rocky walk along the coast. If you are expecting soft sand you won’t find it in Brighton; I’d highly recommend bringing a yoga mat if you want to sit in comfort. The water was warm though and on a clear day you can see the beginnings of the Rampion Wind Farm off the coast which whill be nearly the three times the size of Manhatten when completed! Of course, when you get tired of sitting on rocks, you can always explore the various activities on the beachfront. From arcades to Brighton pier itself, you won’t be bored on your mini-beach vacation! The view from Brighton Pier itself is worth the walk out as you gaze back onto city’s the French Riviera-esque architecture. On our way back to the train station we explored the famous Royal Pavilion Gardens. This little slice of Inda is a former royal residence and WWI military hospital. The garments and outside are a breathtaking and peaceful place to escape the sun and enjoy a picnic before hopping back onto the train back to London! – Cafe Coho: Amazing coffee and sandwiches, this little Brighton gem is a great place to grab breakfast or lunch to fuel your adventure. Located right outside the main train station, this was our first stop. – Gelato Gusto: Gelato, Gelato, Gelato! This cute little stop has won countless Taste Awards for its fresh and fruity treat. Yummy and reasonable! Tiffany is a London based blogger, photographer, and writer who loves exploring new places both within her city and the across the globe. You can explore Tiffany’s work on her blog, MyHappyCoincidence.wordpress.com, and see her photos on Instagram. In addition to writing, she loves photography and is rarely found without a camera in her hand.